There are many reasons why a roof on a house needs to be repaired. Sometimes it has been damaged by weather, other times its old age; sometimes there is a leak. Homeowners often make the mistake of discovering a leak in their home, and then only start checking the problem out. Before that happens, take a look at this guide to roof repairs and learn how you can prevent, repair, and ask for services when your roof gets damaged. Always be on the alert for any major storms so that you can check over your roof, looking out for missing or broken shingles – check for flashing that could be damaged around the vents or chimneys, etc. What materials are used in roofing? Gable roofs are not expensive to build, they are able to shed off water and snow well and you get the extra attic space with the vaulted ceilings. Not very wind resistant though. Hip roofs are sloped on all four sides, meeting at the top to form a ridge, giving the roof strength in high windows. This roof also allows snow to slide off easily. Mansard roofs also have the four sides, each side having a double slope, which forms a low pitched roof. Not the best in snowy weather. Gambrel or Barn roofs are the same as the mansard roofs, except that they are two-sides. Usually, you find barns; farmhouses or Georgian and Dutch-colonial type houses have Gambrel or barn roofs. This roof style isn’t the best where there are high winds and a lot of heavy snow. Flat roof styles are becoming very popular because people are becoming fond of using their roof as a roof-deck or turning it into a bit of a garden or adding solar panels to their flat roof. But they also have a disadvantage in that they are more prone to leaks. They are also less popular in places which get a lot of snow and rain. Roof materials also vary according to regions. For instance, asphalt shingles support snow well, metal roofs are good for rain, slate tiles hold up well against snow, being very durable. Wood shingles offer insulation, allowing air to get circulated. 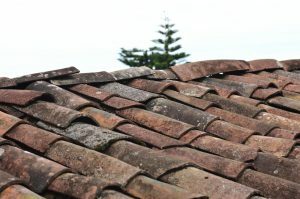 Clay tiles are good for intense heat that blazes down, or heavy rains. The thing is – roofing is a pretty dangerous job to do you if you are not experienced, and repairs to a roof are even just as risky. If it a simple repair, then fixing it yourself might not be all that bad. But when you get in the professionals to look, it means you don’t have to get up onto the roof yourself – that should be peace of mind in itself! With professionals, you know the job will be done right. However, it is also important that you don’t just hire any ‘professional’ though. You need one who is certified to do the job; that has the knowledge. He will give you a quote with his consultation so you know exactly what is wrong with the roof. 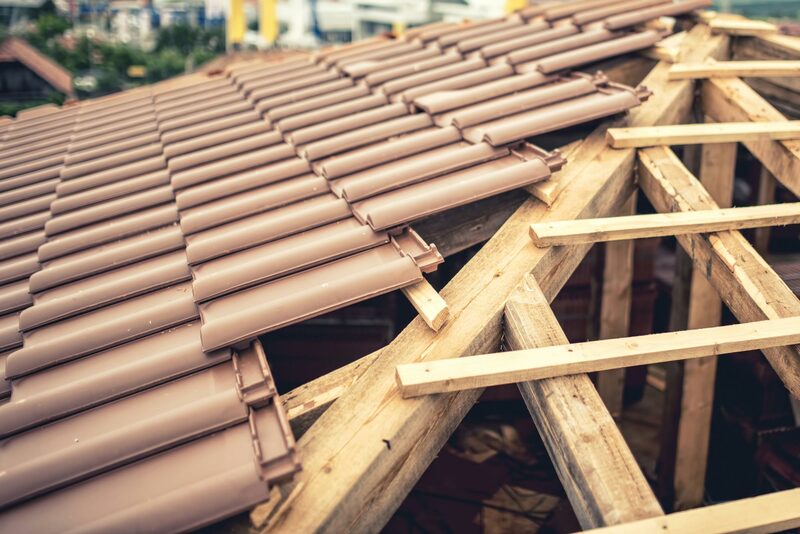 And if you are actually replacing the entire roof, hiring a pro means that there will be also a manufacturer’s warranty, saving you headaches into the future. 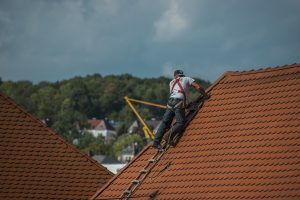 If you insist on doing your own roof repairs, you will need to know 100% what you are doing, that you will be safe and that you will also be saving yourself some money. As mentioned above, it is imperative to get the right roofer to repair your roof. And that means not just choosing the first guy that comes knocking. You need to find someone who is trustworthy, professional and honest. He should be licensed and insured. There are plenty of unlicensed contractors out there trying to get their foot in your door and onto your roof! The right professional roofer will be able to provide you with a copy of his license and be able to confirm his status online as well. A GAF Master Elite Contractor will need to comply with conditions. He will be able to offer you extensive knowledge of styles, colors, materials and much more about your roof. Don’t be pressurized by any contractor who just wants you to sign contracts before your insurance company has come and checked out the damage to your roof either. It can be daunting to figure out which is going to be the right contractor for the roofing job you have in mind to do at your house. You want to get the best for all the money you have to lay out. You also want to know that you have ongoing support. But apart from the certifications and assurances, there are some other factors which you need to keep in mind; to look out for regarding your roofing contractor. He must be licensed to do work in whoever area you live in, as well as be fully insured. In case of injuries that could happen on your property – has he got Workers Compensation? Is your roofing contractor well established in the area you live in? If he hasn’t been in business for all that long or has not built up a good reputation, warning bells should be ringing in your head. The contractor might cough up warranties but these won’t be much good if his company were to suddenly go out of business. Choose the guys who are linked to your community. Experience? Check out your guy’s individual experience and the number of years his roofing company has been in business. Upfront prices: This is very important, more important than your contractor offering you low prices to complete the job. If your contractor offers to do the job at ridiculously (or should we say suspiciously low prices), this might be because there are some hidden fees involved. Or maybe not all the work has been quoted on. Make sure everything is listed, fully detailed. Don’t be afraid to have everything you don’t understand perfectly clarified. The flow of communication: Who wants to work with someone who you ‘can’t get through to’; who doesn’t return your phone calls, or who won’t do what he says he is going to do. This can be pretty frustrating and could lead to much misunderstanding about the work to be done and also the prices! You need to communicate freely and easily with your guys. Sometimes in winter time, roof repairs can become quite common. There are often high winds at great speeds, heavy snow – these are all common weather patterns. It’s during these times that roofs can get damaged, start to leak and become difficult to manage. There are plenty of different problems that your roof could encounter. These problems could well be associated with the type of roof you have for your home. The right roofing company will offer you solutions for the right repairs for the right type of roofing material. When you choose your roofing material, you might believe you have a huge array of choices – like what’s it going to be? Is it going to be composite, asphalt, metal, wood, rubber – just fix the roof from this wide array of materials, right? But not so. There are plenty of other factors that determine what roofing materials you choose. Certainly, a huge factor is the roof pitch. You might want to choose a certain roofing material, forgetting to realize that if the pitch of the roof is below a particular ratio, you might well have to install a different type of roofing. You can certainly enhance the look of your home and the property value with a new roof design. But in changing roof designs, you also need to realize that the right roofing materials and the right colors for you might not necessarily bring the right value to your properly. In fact, it is only top quality roofing products that are able to stand the test of time, that won’t fade and lose value. It’s the right design and materials for the right weather condition and what’s in vogue in your area too. And when it comes to color, look for colors that match all your other outdoor designs. You are able to improve or deteriorate your home appearance just by painting your roof! Adding bright colors is fine if they are cleverly done and enhance your home in an artistic way. 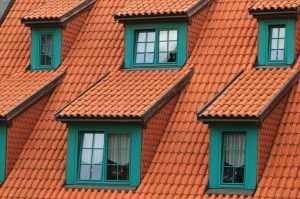 Roofing shape too plays a huge role in defining a home’s total look. Changing the shape and design of your roof can provide you with even more living space – it can make your home more energy efficient or more resilient to weather conditions. You can certainly enhance your property with the right roofing styles and it is very important what you choose! The choice to repair your roof or to replace it can be an easy decision. If you discovered a smallish repair job or a single leak for instance that doesn’t affect the whole roof, then the repair would is your natural course of action. But if old age has taken its toll, then replacing the entire roof is the best choice usually. Asphalt shingles, the most popular roofing material choice. They are cheap, dependable, easy to install. However, they are the least durable choice. Wood roofing is not as popular as it used to be. 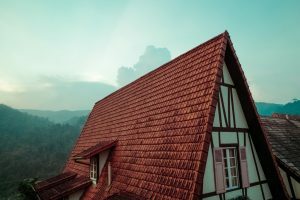 Wood roofing is aesthetically attractive but has become more expensive than the asphalt, requiring more maintenance over other roofing materials. Metal roofing has become popular and becoming even more popular. It was considered a noisy type of roofing in rainy weather in the past, but today’s metal roofs offer a total balance of durability and affordability. Tile roofing is very popular in certain areas, being very durable, but very expensive. Installing a tile roof is an investment in making your house very attractive. You certainly increase its worth as well. Slate roofing is considered the ultimate roofing choice. As far as durability goes, nothing matches it. The look of slate doesn’t appeal to everyone though, but it lasts well over 100 years, coming in at a hefty price tag. Some of the above roofing material choices make better candidates when it comes to repairing than others do. When it comes to tiles and slate, replacing them is not the best choice unless they are older than 70 years. But even then, repair might be a better investment than adding a whole new roof. But on the other side, a wood roof for example; when it falls into disrepair or is damaged sufficiently to need much work, your best bet would be a replacement. Further to that, it might be better to replace wood with some other material altogether. With high maintenance required and not a good life expectancy, wood roofing has kind of gone out of fashion now for these very reasons. Those who know a bit about roofing, sing praises when it comes to modern, durable metal roofing. Firstly, it hardly ever needs repair. If it has been around for years and years, probably past its expiry date, then it might require replacing in any case. Asphalt, it’s true, it can be patched time and time again. However, it’s also true that asphalt probably ages quicker than other roofing materials. The best thing about asphalt is that people can afford it usually. You could probably replace your asphalt roofing a few times over before equaling the price of some of the other expensive roofing material types. When an asphalt roof is damaged, your best bet is to get in the roof inspector because they will give advice on prevention measures to take to extend its life. They will also be able to say whether you should repair or replace. What other types of shingles are there? Asphalt shingles are the most affordable and popular amongst the shingle types and this includes even the organic shingles and fiberglass shingles. Asphalt shingles don’t do the best in places where you have huge temperate fluctuations, which can cause cracking. Asphalt shingles with a fiberglass base, layered with a coat of waterproof coating makes fiberglass shingles durable, UV-ray resistant, fire resistant and lightweight. Organic shingles are waterproof and weigh in a bit heavier than fiberglass shingles. They don’t last as long as the fiberglass ones and are cheaper. They are called “felt mat asphalt shingles”. They are not really recommended because they can and sometimes don’t reach their 20-year life expectancy. They are inexpensive and thin; also with a 20-year lifespan. They are made with cutouts. Cutouts are the open parts of a strip-shingle between tabs. They are cheaper than architectural shingles. They are also called laminated shingles dimensional shingles. They are very high-quality shingles, made from a heavy fiberglass base with mineral-granules coated in ceramic and embedded in asphalt that is waterproof. Being very stylish, people love tile shingles for their Mediterranean, Colonial-Spanish type houses. It is because they are so attractive to look at and can last for around 80 years. They are a little on the expensive side. Wood shingles are more environmentally friendlier than other types of shingles. They can last between 30 to 50 years. They are also energy efficient. A drawback is they can catch fire. Although people say this type of roofing is noisy in rainy, hail type weather, a metal roof still ranks as one of the most popular choices for roofing, able to endure for more than 50 years. Slate shingles are probably the most expensive. This type of roofing can last for over 100 years. It is highly resistant to water and other types of damage – expensive. Choose your roof shingle type! Are there cost-of-roof-repair permits in your area? Sometimes roofing pros need to have a repair permit, and these costs can differ according to where you live, the size of your home, whether you live in weather danger-zones and so on. All these factors may cause the permit price to rise. It’s actually all to your benefit though because you are able to follow the processes by checking out inspection cards that get posted roofing-permits. Costs for shingles will vary a lot. Asphalt shingles are the cheaper type shingles. Labor cost required to work with all the different type of shingles will vary as well. It all depends on how much repair work is required. The amount of the work required will greatly impact on what the overall costs will be. Generally speaking, roofing repairs are calculated by units of about 10 sq. ft. In roofing circles, this is called a square. With shingles usually being sold in these squares, you are no doubt going to be charged for a shingles ‘square’. You might have a chimney on your roof or a special skylight. This will mean the professional roofers will have to work around these areas, taking them into mind. During an inspection, they might discover that those special elements might have become damaged as well. Therefore, he might need to repair those areas too. You will need to be prepared that that can make a difference in your costs as well. If you have suffered water damaged to your roof, this will need to be considered. Water damage could well include needing to replace the whole roof. That will certainly cost quite a bit – it won’t be great to have to confront the fact that your roof has major water damage. Sometimes the professional roofers won’t even be able to assess or address the water damage until they have actually removed some of the shingles either. For final costs, you will get the best idea by doing your own bit of research on what roofing costs are; remember also to find the right contractors who will be honest and upfront with you around these costs. You keep good tabs on your house and its roof now – and leave the repair work to the pros to keep you covered!